Stack ‘n Spin Burger is rated 3.3 out of 5 by 7. Whirling, spinning and spilling fun with stacking rings that build the world's most baby-friendly burger! The Stack n' Spin Burger™ from Bright Starts™ Giggling Gourmet™ Collection allows baby to stack and re-stack the ingredients of this silly burger any way they choose! 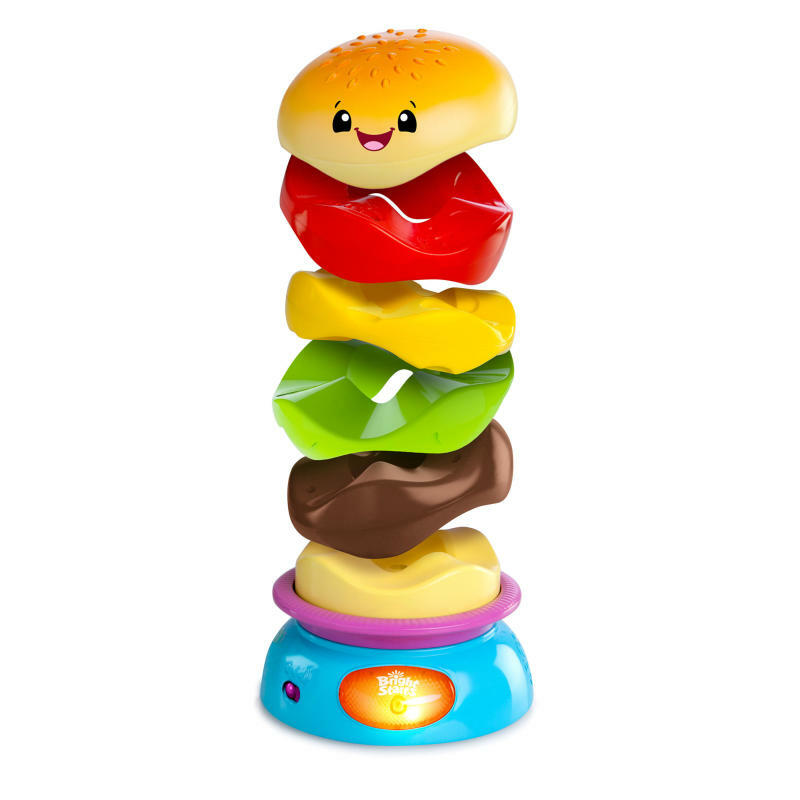 When the burger is stacked, baby can press the light-up button to see the burger spin faster and faster until the pieces tumble down into a pile - which is sure to get the giggles going! Stack to start the fun all over again. We call it the Giggling Gourmet for a reason! Dimension (in) 5.25" x 5.25" x 8.5"
Rated 1 out of 5 by Simo from Massive let down!! Ought this for my 6mo, doesn't spin. Waste of money. Should have just bought building blocks. Rated 5 out of 5 by Chipper from Awesome My granddaughter loves this toy. Shes knocking it down then i stack it up. It sounds boring but is so fun for the both of us. She can play all by herself but i have to join in. Such a good toy to bond with. Cant figure out if the red piece is ketchup or tomatoe. Rated 1 out of 5 by HemphillTwins from Doesn't Spin My twins received this toy as a present for their first birthday. It spun twice the day they opened it and it's never spun again. They like the music and to stack it, but sadly this product was a bust. Rated 4 out of 5 by MeaganM from Very Entertaining! My 8 month old baby girl loves this toy! She loves the noises it makes as well as the spinning of the pieces. The colors are bright and the music is fun.. this toy definitely helps strengthen her stacking skills and she loves to chew on the pieces. I would recommend this to any parent who's young ones love sounds, music, fast motions and being able to stack and learn! Rated 4 out of 5 by Jen729 from Child enjoyed but fad wore off fast I received this toy to review. MY son is 22 mths. He played with this toy & loved when the pieces spun off. He laughed. However, after rest acing about 5 times he lost interest in it. It seemed the thrill wore off. However, when he was playing with it, he enjoyed it quite a bit & laughed every time. Was entertaining & improved his stacking skills. Rated 4 out of 5 by Jenn78 from fun fun fun Both my 7 month old and my 3 year old enjoy playing with this toy. They love stacking it up and watching it spin . Rated 4 out of 5 by rsoeunjones from nice big pieces My son loves to chew on the "burger" so I love the big pieces. He enjoys knocking it over himself then having it spin and fall. My older kids like playing with it also. The only flaw that I see is that there is no way to lock to pieces together so that its easier to store without seacrhing for the pieces later. Other than that, its a wonderful toy.